Cilantro is a member of the carrot family that has been cultivated for centuries. The leaves of cilantro are sometimes called Chinese parsley as they resemble flat Italian parsley in appearance. The seeds, or fruit, of the cilantro plant are known as the spice coriander, although often the two terms are interchanged in recipes and food articles. Cilantro is an annual herb that is best started from seed, after the danger of frost has passed in the spring. It will grow from 12 to 24 inches tall. Plant in full to part sun, in moderately rich, well-drained soil. When cilantro seedlings appear, thin to at least four inches apart. Successive sowing every two weeks ensures a plentiful supply of the young immature leaves so valuable in cooking. Cilantro can also be grown successfully in a pot placed on a sunny windowsill. Just pick the leaves as needed to use in recipes. A mature cilantro plant does have a pungent odor, and the older leaves may develop too strong a flavor, so it is best to pick only the young leaves for culinary use. The coriander seeds develop a light citrus scent as they ripen and this becomes pleasantly more fragrant as the seeds age. Harvest cilantro soon after the leaves and flowers turn brown, before the seeds begin to fall. Hang the entire plant upside down to dry, gathering the dried seeds as they fall from the plant. Store seeds in air-tight jars. When harvesting fresh leaves, choose small, immature foliage for the best flavor. Dried cilantro leaves do not store well. Cilantro is also available as fresh herb sprigs in the produce aisle of most grocery stores. You’ll find coriander seeds or ground coriander in the spice section. Use fresh cilantro leaves or ground coriander in lentil or bean soups; add to salsa, taco fillings or corn salads. Mix chopped fresh cilantro with butter to drizzle over fish or vegetables. Whole or ground seeds add pinache to marinades, salad dressings, chili sauce, guacamole and pickling brines. You can use a mortar and pestle to grind a small amount of seeds to use in recipes. Add 1/2 teaspoon of ground coriander seed to the batter in your next banana bread or carrot bread recipe. Flavor chicken, fish, lamb, pasta, rice or vegetable dishes with cilantro. This versatile herb also adds distinctive flavor to Caribbean, Indian, Thai, Chinese and Mexican dishes and goes well with most “hot” cuisine, including curry and chili sauce. 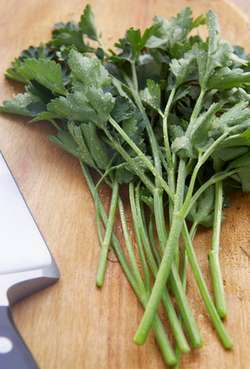 Cilantro root is also edible, with a taste similar to that of the leaves, with an additional nutty flavor; cilantro root is often minced fine for use in Thai cooking. To make a coriander marinade for one pound of fish or shellfish, combine 1/2 teaspoon of ground coriander seed, 2 ground allspice berries, the juice of one lemon, and a dash or two of olive oil. Marinate fish or shellfish for 30 minutes before broiling or grilling. A nice relish for spicy poultry or lamb can be made in the food processor. Combine 1 cup of fresh cilantro leaves with 1/2 cup mint leaves, 2 cloves of garlic, the juice of one lemon, a minced hot chili, and 1/2 cup of blanched peanuts. Add all ingredients to the food processor and add a dash of olive oil; process until smooth. Serve as a side dish. Add all ingredients to a large glass or ceramic salad bowl. Add salt and pepper to taste and mix well. Store in the fridge until serving. Use on pasta or in place of basil pesto. Put all ingredients in the blender or food-processor. Process all ingredients except parmesan in a blender or food processor until well mixed and finely processed. Add the Parmesan and process briefly to blend. Add sour cream if you wish to use this pesto as a dip for shrimp, vegetables, or crackers.